You are here: Home / Breaking News / Where to go if Pilgrim blows? Where to go if Pilgrim blows? Map courtesy of the Commonwealth of Massachusetts/MEMA. If an emergency were to occur at the Pilgrim Nuclear Power Station, before or after shutdown, the local, state and federal governments have developed complex plans for mitigating such a disaster. The plans are most detailed for a 10-mile radius around the plant known as the Emergency Planning Zone, or EPZ. Plympton and Halifax are outside the EPZ, although emergency evacuation routes for those within the EPZ run through the two towns, according to publicly available plans. The 10-mile EPZ, at first glance, might seem arbitrary, but emergency planners deny this. 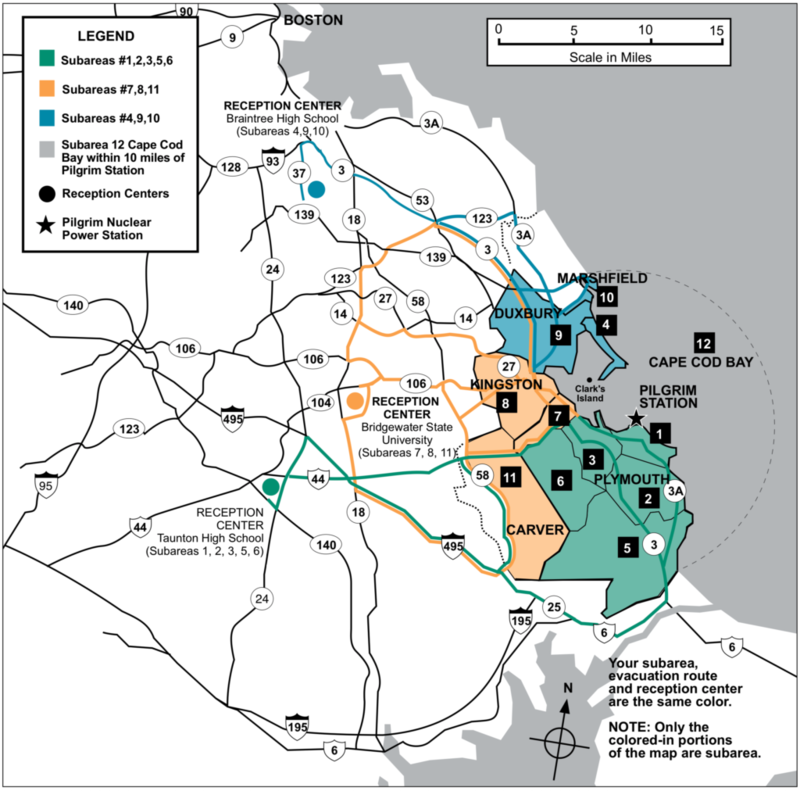 “The … EPZ is not random; it is based on the NRC’s assessment of the immediate inhalation-based risk following a release or potential release from the plant … If we had a release, the long-term exclusion zone might be larger than the 10-mile EPZ; that would be determined on a case-by-case basis,” according to Massachusetts Emergency Planning Agency (MEMA) representative Christopher Besse. Residents of surrounding communities that are not in the EPZ, such as Plympton and Halifax, would not be directed to evacuate but might be asked to remain off the roads, if possible, to facilitate the evacuation. This likely would be a request; not a directive that they shelter in place, he said. If an evacuation was ordered of some, or all of the EPZ, traffic control points would be set up throughout the area to help facilitate the evacuation and movement of vehicles, he said. Besse said that if a precautionary transfer of school children from schools in the EPZ to host schools outside of the EPZ was initiated, as plans call for, Plympton and Halifax parents would go to the Bridgewater/Raynham Regional High School “host school” to pick up their children as Kingston, including the Silver Lake Regional Middle School and Silver Lake Regional High School, is in the EPZ. This transfer of school children would be done early in an emergency, before an evacuation of the entire population is ordered, he said. Generally, a full evacuation would not be ordered until the plant is at a higher emergency classification. Planners have prepared for parents of school children to pick up their children at the host school before a full evacuation begins. This timing, he asserts, would help alleviate traffic congestion. However, if school children were transferred at the same time as an evacuation of the EPZ is taking place, staffed traffic control points and the existence of multiple evacuation routes would be sufficient to effectively move the traffic out of the EPZ and in and out of the host school, Besse said. gency Planning Zone, or EPZ.